I've seen cocktails lit on fire, but never actually mixed with the flame inside the cocktail! This is insane! and tulip-shaped are recommended) mug with a handle. Light the mix on fire. While still ablaze, roll the mix into an identical mug and back again 4-5 times. the mugs over top to extinguish the flames. Pour over a tray full of water. 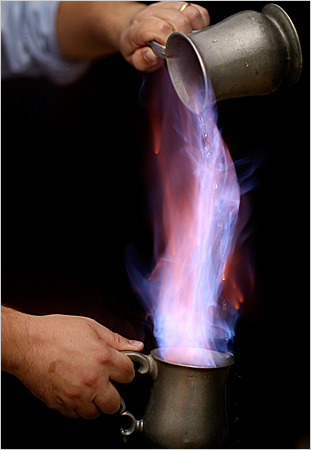 You don't want the fire to go out while pouring. Pour only 1/2 of the contents each time. Mix it quick as the handles will get hot. Turn the lights down for effect and to make it easier t see what you are doing. Go outside the first few attempts at flaming. Thanks to About.com for the info! Below the clips of these cats making it will be a few cool books by Jerry Thomas. Enjoy!